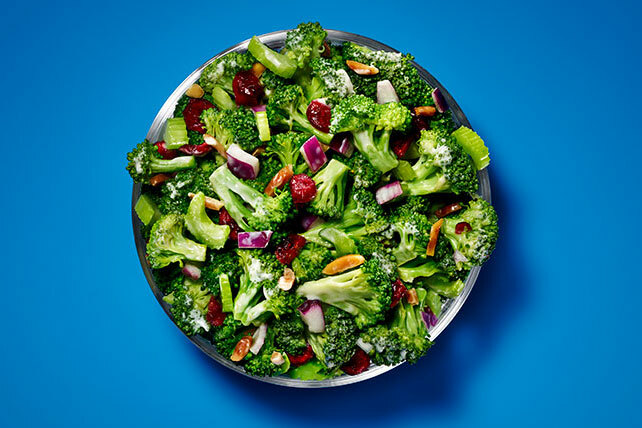 A combination of MIRACLE WHIP, vinegar and dried cranberries gives this Crunchy Broccoli Salad its tart and tangy flavor. Mix dressing, sugar and vinegar in large bowl until blended. Add all remaining ingredients except nuts; mix lightly. Refrigerate 1 hour. Sprinkle with nuts before serving. Vegetable salads are best served crisp and cold. To keep the salad chilled when serving, place the filled serving bowl in a larger bowl filled with crushed ice. Add 4 cups loosely packed torn lettuce or spinach leaves to salad just before serving.